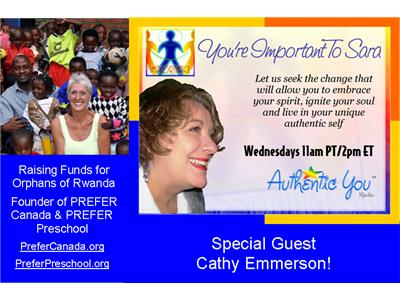 Cathy Emmerson spent the majority of her adult life selling real estate in her hometown of Maple Ridge, BC ...until she took a trip to Rwanda. Cathy had visited other African nations but had never felt the enthusiasm and energy that was created by the people of Rwanda. There was a stirring of growth and a desire for prosperity. Cathy felt the changes that President Paul Kagame and his government were implementing, and wanted to be a part of this small nation’s journey out of genocide, pain and poverty to become a leading example for the entire continent. Cathy moved to Rwanda in 2003 and began PREFER Poverty reduction, Education and Family empowerment in Rwanda. In 2007 Cathy married Uwayo Teste and together they have built PREFER preschool that is home to 164 preschoolers ranging in ages from 2 years to 6 years old. PREFER has a number of projects including building homes for vulnerable families, sponsoring secondary students in their studies, hosting afternoon classes for adult literacy, Mama and baby hygiene classes, English lessons and computer skills. To date PREFER has placed over 2000 goats into vulnerable families. Rwanda Prefer Society, based in Maple Ridge, has received Canadian registered charity status as of December 30th, 2011.